From space you can see the great barrier reef, the great wall of China and my great big roots. Nothing worse than realising your hair appointment is still two weeks away and your roots look so dark. I had kind of dismissed this Colour Wow product. I thought it wouldn't work, would look chalky and would make my hair feel gross. I was so wrong!! These slimline palettes contain a mirrored lid, a section of the pressed powder colour and a duel ended application brush. The idea is to use the firm end of the brush to apply the powder with precision to the roots. You can then use the larger end to dust over bigger sections. 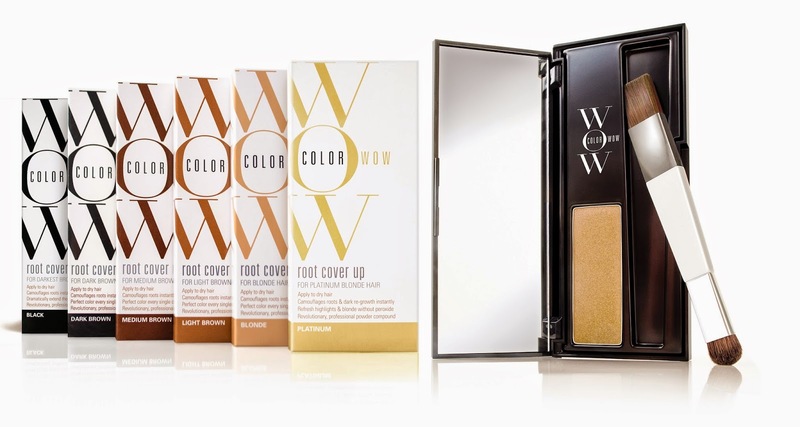 The powder is available in six colours. A black, three shades of brown, a blonde and a platinum. They can be used on greying hair or in between hair appointments to cover the root. It doesn't mask the hair in a thick covering but lightly dusts over and clings to the hair to brighten, add a tint of colour and lift the darkness. It can be used on all hair types and is particularly good on greasy roots as the mica and talc help to absorb the oil. The colours are very versatile and you don't have to get an exact colour match (obviously go lighter rather than darker). Just go for the closest option and it will blend really well. If you touch your hair throughout the day then you may want to carry this in your bag to touch up but otherwise it lasts really well. Can be brushed out or washed out at the end of the day. If you get caught in the rain it's going to fade away but it won't run down your face because it's just a super fine powder. My hair is a honey blonde but I tested the platinum Colour Wow on my roots because I wanted to lift and lighten. I was amazed how much it made a difference. I just quickly dusted the powder over in a few seconds and it looked like I had just had my hair highlighted! 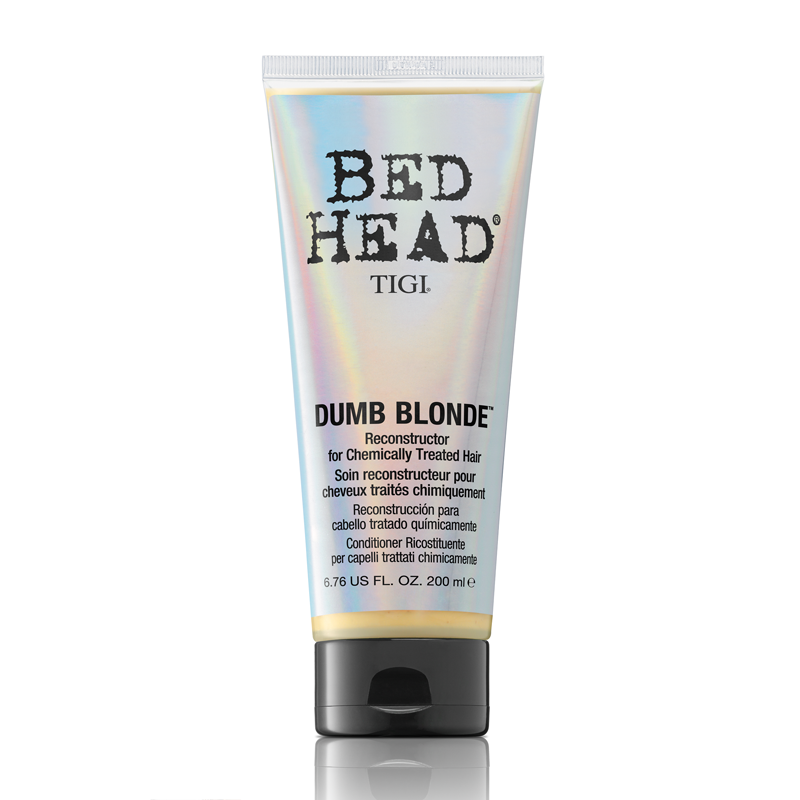 Not cheap at £28.50 but a product which will last you months and months and is a savior on a bad hair day. The nights are drawing in so you know what this means guys....Candle time!! There is something really comforting about getting home, closing the curtains and lighting a candle. Heyland and Whittle are a British brand created by husband and wife team Paddy Heyland and Ursula Whittle. They also make reed diffusers, room mists and soaps. We have recently been sent one of their new 3 wick candles. Made from soy wax which burns evenly. The candles are set into a heavy glass bowl which contains 480g of candle, that's a whole lot of candle to burn! The scent we have is green tea and grapefruit. Citrusy, zingy and fresh. As soon as you open the box the room is instantly filled with the scent. All three wicks burn at the same time and because there are three flames there is a lot of light which radiates from it. Looks beautiful on a dark autumn night. This candle will have around 40 hours burn time. The glass does get hot as you burn it so make sure you stand it on a mat and that small hands can't get hold of it. Other scents which are available are orange spice and wild lemongrass. Available this month from http://www.heylandandwhittle.co.uk/Greentea-and-Grapefruit-3-wick-Candle-in-a-Glass-p/r0028.htm for £40.00 each. I know it's crazy. BB, CC and now EE! I don't know where it will end but i'm already Zzzzing at the thought of it. 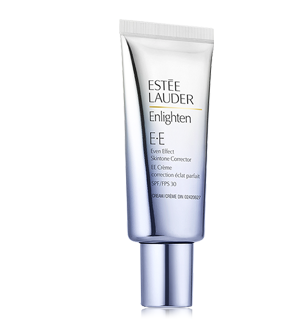 Saying that and totally contradicting myself, the EE cream from Estee Lauder is particularly lovely. EE stands for even effect in this product and it's purpose is to minimise dark spots, even out areas of darker pigment from scarring and acne, tone down redness and even out pores. All done with a sheer natural colour. The texture is a little sheerer than the most natural tinted moisturiser so don't expect a flawless finish with this. The finish is super radiant, almost glossy. Very hydrating and will give a dry, dull skin an instant high sheen finish. Has an SPF 30 but doesn't flash back at all. Available in three colours of light, medium and deep.Wear this on top of your moisturiser as your base or if you need or prefer more coverage wear it after your moisturiser but before your regular foundation. On a dry skin such as Sam's this product looks phenomenal. Sam does have a pretty even skin in the first place so it's not hard for her skin to look radiant and glowing. On a combination to oily skin I personally didn't find it worked quite so well. It feels very hydrating as you apply and that feeling of moisture never really sinks in on a combination/oily skin. Looks beautiful to start with but as the skin naturally produced more oil throughout the day the skin started to look more sweaty than radiant! This is £34.00 for 30ml. Have you tried this product yet? We would love to know how it worked for you. Multi purpose, opaque shimmer, long wearing, crease proof...I could go on with the lovely descriptions. New this October are Bobbi Brown's long wearing gel sparkle liner/shadow. These cream pots have a duo purpose. They are an intensely pigmented, cream eyeshadow which is infused with a 3d prism effect. The reflex pearl is different in each shade. Available in five different flat shades but packed with a variety of gold, teal, silver and rose gold fine shimmer pearl. The shimmer in this is beautifully delicate but packs a punch. Catching the light and reflecting multiple tones. Blends over the eye lid easily and once dry it stays in place with no creasing or movement. The glitter stays localised also rather than travelling all over your face. These would give a good solid base to powder eye shadow but it seems a shame to mask them with a powder. Sweep all over the eye lid and low under the eye for a grungy wet look shimmer for the evening. We had four shades to show you. There is also a gunmetal available called Thunderstorm. These also perform as a gel liner. Using a thin brush create a shimmering feline flick. Colour will stay in place and create a good solid shape. I found I did have to build the colour up when using as a liner. Leave each layer to dry and apply another until you have the desired coverage. It's a little 'wishy washy' with just one layer. Some new powder foundations have landed on my desk this week. Not a product that usually excites me to be honest. I think I always have images of the caked, flat faces of 80's pop stars in my head. They have come a long way since then though and thinking I really should pay more attention to what is new in the world of powder bases I have had a play. First up is Burberry Fresh glow compact foundation. 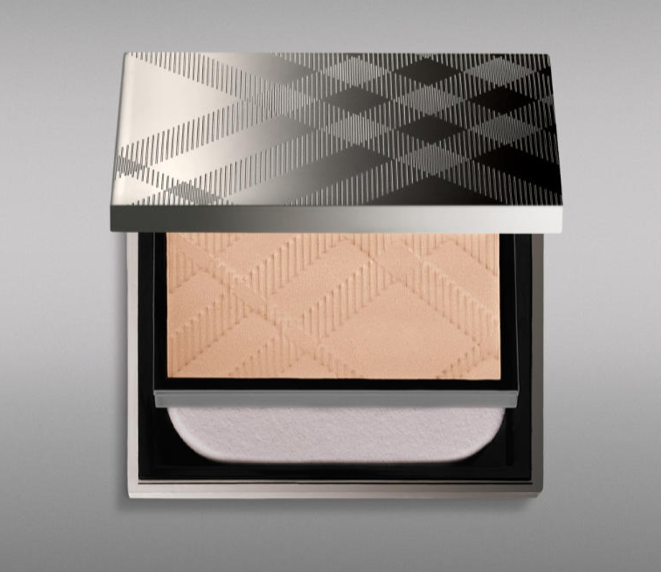 The compacts from Burberry never cease to grab my attention. Solid looking gun metal compacts subtly embossed with the Burberry pattern. Not a huge amount of colour choice with this one unfortunately. The four colours they do have are split between yellow and pink tones. The lightest two are pink undertones and the darkest two are yellow. This powder provides a sheer to medium cover and looks beautiful on the skin. It doesn't look like a powder at all. It doesn't cling, cake or mask the skin. Rather than a matte finish it has a luminous, satin finish. It basically looks like you have a pair of 2 denier satin tights over your face! Skin tone is evened out and left looking healthy and radiant. If you have a combination or oily skin tone this will matte away your natural oil and replace it with a radiance. On dry skin I would suggest using a damp sponge to apply with to ensure it doesn't stick to any dry areas. The damp sponge will also increase the luminosity. Only downside for some people may be the scent. It is infused with rosehip and lavender so has quite a powdery soap smell. I love the scent but if you're not a fan of fragrance in products it may put you off. Reminds me of the scent of Parma violet sweets if you remember those! Not cheap at £38.00 but you can feel the quality on the skin and it lasts all day without sinking into lines. 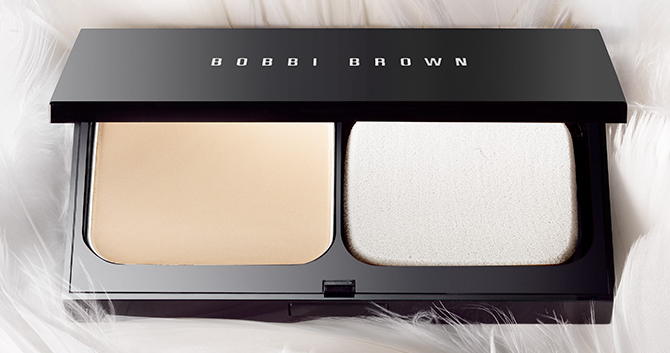 New from Bobbi Brown is their Skin Weightless powder foundation. Well done Bobbi Brown for having a huge colour line up of twenty shades. Ranging from alabaster through to espresso this foundation caters for a larger skin tone mix. I like the feel of this foundation. It's oil free but feels more like a cream to the touch. 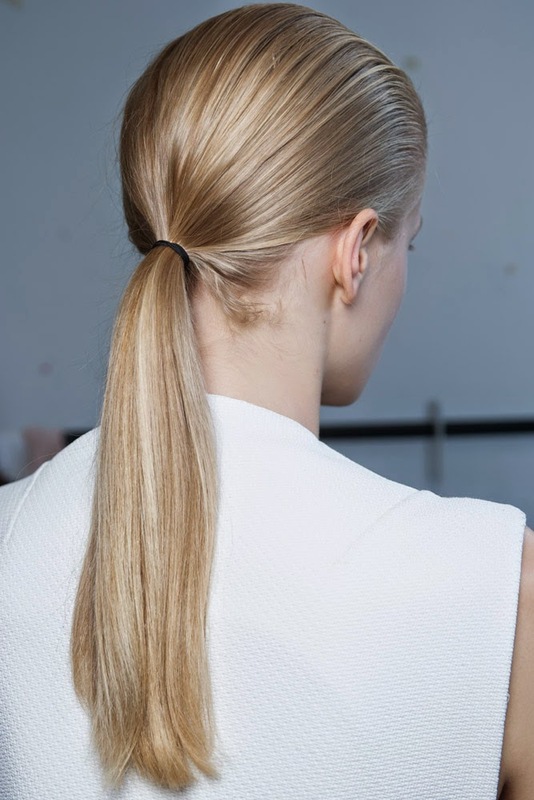 It's very airy and light in texture and will give you a sheer to light cover. Not a foundation for those who like a good coverage. Gives skin a natural fresh finish that resembles skin. It doesn't have the luminosity of the Burberry powder but would be a winner on all skin types due to the matte but creamy texture. Wears well and photographs lovely. Would make a nice addition as a powder on top of your regular foundation if you prefer a bit more cover. £33.00 and comes in a slightly more bulky mirrored compact. Lastly is the new Clinique Anti-blemish solutions powder makeup. Out of the three this one feels more powdery. It also has more of a coverage giving a medium buildable look. The powder is jet milled to ensure it is super fine powder particles so it won't cake on the skin. Because of the more powdery finish this one works better on a combination to oily skin tone. 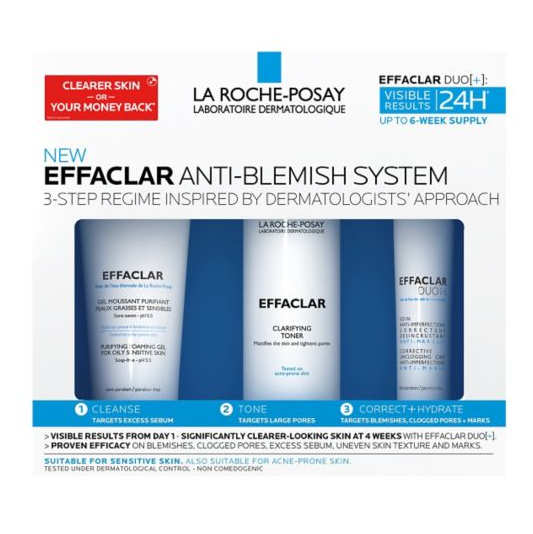 Aimed at those who suffer from blemishes it contains salicylic acid to help with skin texture. It is also sweat, humididty and water resistant. Available in thirteen shades although I could only ever view twelve shades online. I like the finish, a little too heavy texture for me but looks natural and evens out skin redness well. Lasts well on the skin and didn't cake when I touched up throughout the day. 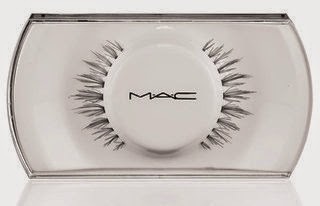 This compact is £24.50. 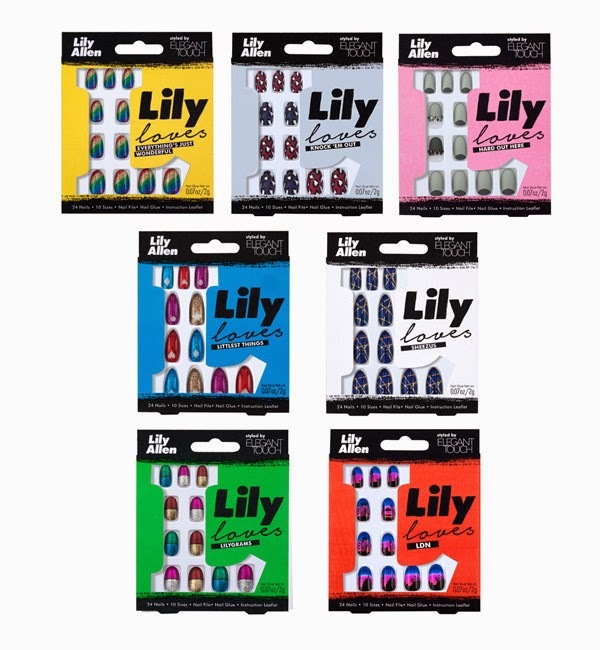 Lily Allen has collaborated with nail brand Elegant Touch and produced some super cute false nails. 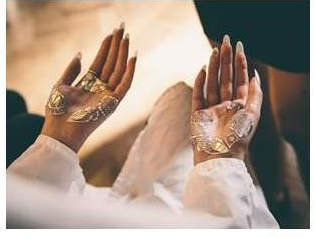 If you follow Lily Allen on Instagram you'll notice that nails are her thing! Not one to shy away from talons fashioned with gems, glitter and patterns she has produced seven different styles. Each set is named after her song titles and feature rainbow glitter, metallic shapes, matte prints and gem stones. Prices range between £6.99- £8.99. Our favourite set features silhouettes of iconic London landmarks such as the gherkin, Big Ben, o2 arena and St Pauls. We often get asked what we have been purchasing recently or what is in our make up bag. Nic has just returned to the office with a bag of new loveliness that she is excited about so we thought we would share her purchases with you. These are part of MAC's latest launch called a Novel Romance. These are powder eye shadows which feel spongy and almost like a cream. Powder is pressed into the pot in a solid formula. They give quite a sheer wash of colour which has a high pearl finish and look similar to the MAC pigments when on the skin. There is no drop down from these products but the shimmering pigment does travel slightly on the face. Enough colour to wear alone but they do look particularly beautiful on top of other shadows to give a shimmering vibrancy. Nic brought three shades in Pure Flash, coli and superwatt. Pure flash is a champagne with a silver shimmer. Superwatt is an beige/apricot with gold shimmer and coil is a gorgeous antique rust/copper. This colour is stunning. These were £15.50 each and are available we believe for a limited time. 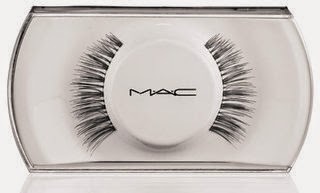 These are regular lashes MAC always stocks and were £10.50 each. 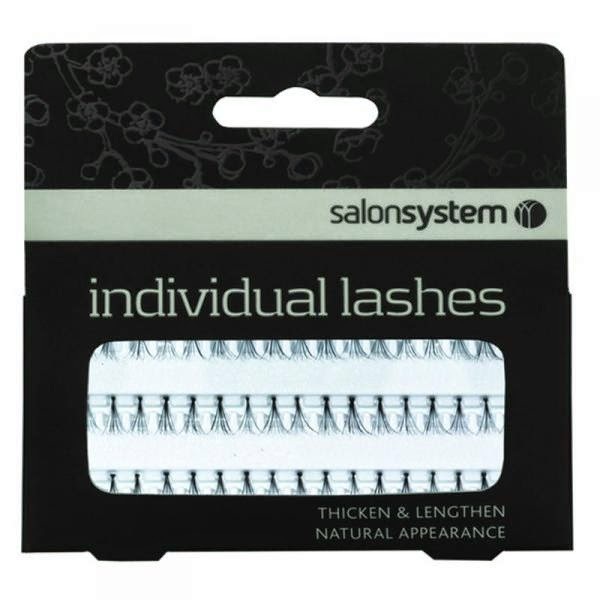 Salon system lashes in the short length. 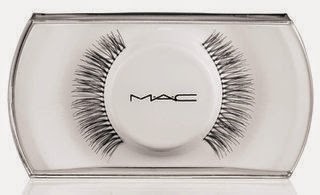 These lashes start at around £3.00 depending on the size box you get. 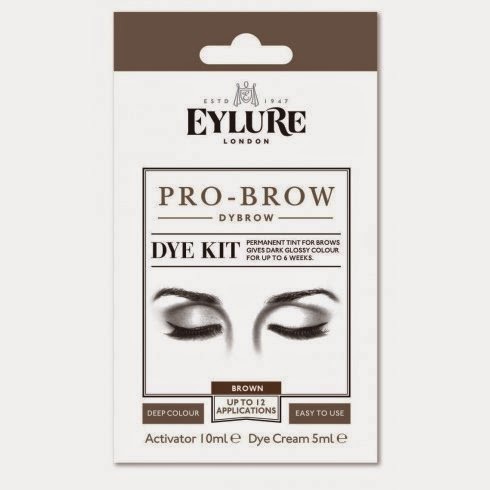 Nic purchased the dye kit in brown. This lasts up to 6 weeks and gives the hairs a rich, warm brown tint to the brows. What have you purchased recently that you are loving? London fashion week kicked off last Friday for Spring/summer 2015 and all weekend we have been getting updates on what's been going on. We thought we would share some key looks with you. Brazilian fashion designer Mariana Jungmann collaborated with Face Lace showcasing their pearlescent foil pieces for the face and body. The inspiration was a magical underwater sea world making the models look like sirens of the ocean. 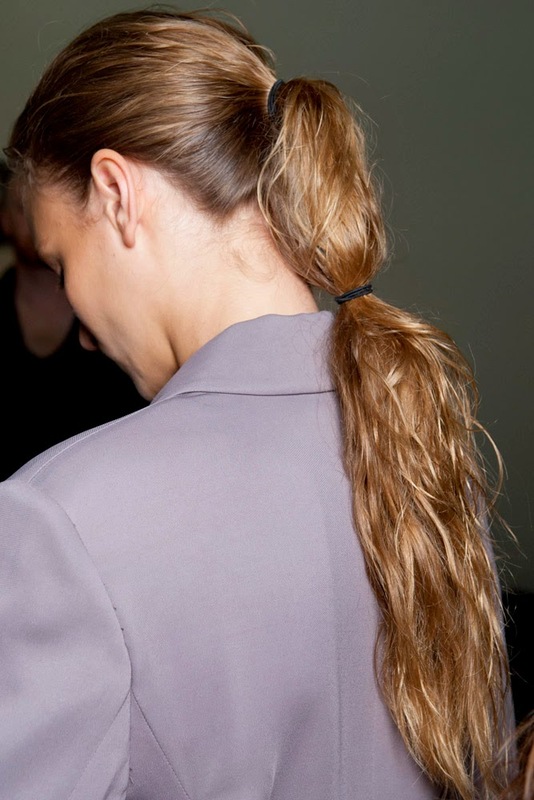 Luke Henshaw for L'Oreal professional created a messy tomboy style for the Daks show. Based on the Teddy boys of the fifties it had was slicked back at the sides but with a feminine twisted plait at the back. 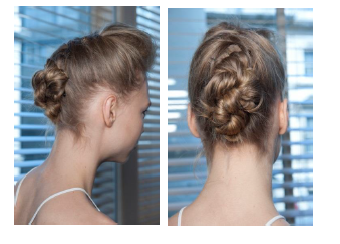 Adam reed again for L'Oreal professional created a semi wet look, worn in pony tail. Using a metallic gloss from L'Oreal TechniArt to slick back the sides. We will keep you up to date with the looks from this years show as we receive them in. What looks have you seen that you particularly like this season? This time of year we do see a ton of similar palettes and although beautiful in their own right it's sometimes hard to distinguish one from the next. When I saw this new palette from Bobbi Brown (launching this September) I thought is this going to be something like I have already seen. How wrong to jump to a conclusion! What I loved about this palette first of all was it's size and shape. Rather than a long palette this duo layer powder shadow palette houses eight shades in a mix of finishes all neatly packed into a 3'x3' palette. The tortoise shell effect palette has two layers. The top layer pulls back on opening and the bottom layer is a drawer which pulls out. Includes a buttermilk with a matte finish, a soft apricot, also matte and a mink in matte. The forth shadow provides a sheer wash of wet look sparkle set in a smokey taupe colour. The fine reflective pigments include gold, rose gold and silver glitter. A shimmering pearl pink with gold and lavender glitter, a metallic champagne, a metallic grey/taupe and a matte aubergine/black in matte. The last colour could also be used as an eyeliner also. No fall out from these shadows onto the face although the glitter does travel into the other shades a little in the palette. Colours blend easily and there is good selection of tones and shades to take your makeup from day through to night. The size of this palette makes it ideal for travelling or to pop into your handbag. The mirrored lid makes is simple to touch up on the go. This palette is £48.00 which I actually think is not a bad price for eight great quality shades in such a convenient sized palette.